WHAT KIND OF FISH CAN I PUT WITH MY PAINTED TURTLE? WHAT ARE SOME GOOD TANK MATES FOR MY PAINTED TURTLE? Well, you can actually keep painted turtles with fishes maintaining some considerations. Specifically, you have to keep an eye on the shape, size, and type of fish. That is you cannot keep very small fish on the tank, this may become your turtles prey not a companion. Moreover, a giant fish may cause your turtle to become its prey or be the cause of an injury. Therefore, fishes that are slightly larger than your painted turtle are the most preferable ones to accommodate. As said before you cannot keep fishes that are very small in size compared to the painted turtle. On the other hand, giant fishes are also not suitable at the same time. Therefore I am mentioning some preferable type of fishes. You can easily go for Light footed fish. By light footed fish I mean fast or agile fishes. Fishes that are fast on feet are less likely to be in danger. As these fishes move faster, the chances are very little to be hurt by turtles. Moreover, there are some mentionable good tank mates to keep with your painted turtle. Zebras and tetras are an exclusive choice for accommodation with painted turtles. They almost met all the qualities that are important to be a good tank mate of painted turtles. They are quite agile and fast. Moreover, if I come to the fact of availability and affordability then it also coincides here. Zebras and tetras are quite common to find and prices are relatively cheap. You can easily introduce a bunch or zebra or tetra to your aquarium. And if you love a number of companions then you can introduce both. Suckerfishes are one of the most common tank mates that are seen in every type of aquarium. They are seen with almost every common fish species as tank mates. Hunting fishes and companions is the most common nature of turtles. If you are thinking that the sucker fish will become your painted turtles’ prey then there is a fact that sucker fishes usually stuck around the lower part of the aquarium and the turtles usually love to be in the upper part. So, there is no chance of collision. Moreover, if you are thinking about by-product then know that sucker fishes live on eating wastage. Keeping sucker fishes as tank mates are good in both ways. One as companions other as a cleaning agent! After getting good accommodation and companions for your painted turtles, you can start adding a small number of yellow cichlids. Yellow cichlids are an aggressive kind of species. If you want to add them to your aquarium them don’t add much of them. They may seem to be harmless but if a good number of them are added with your painted turtles then your painted turtles might be at risk. Your turtle may get attacked by a group of yellow cichlids and your turtles’ life might be at risk then. You should always know about the dos and don’ts. While you are here to know about what type of fishes to keep with your turtles, you should also have a knowledge about the fishes to never ever introduce. Fishes that are too aggressive or the fishes that live on reptiles are particularly harmful to your painted turtles. 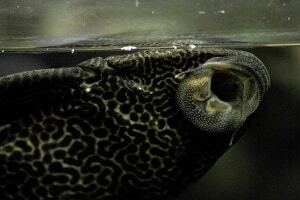 Fishes like catfish, lobsters, piranha, and electric eels are the most dangerous ones. Never ever introduce them with your painted turtles. While you are searching for good tank mates for your turtles you may be decreasing life expectancy of them if you introduce such fishes. In turtle keeping, this is one of the most burning questions that I get nowadays. Is goldfish a good tank mate for painted turtles? Well in one word I will not suggest to keep them with painted turtles. This is because they produce a lot of waste that becomes difficult to clean and the aquarium water becomes unhygienic very fast. Moreover, the temperature of goldfishes differs from that of turtles. The pace of accommodation would be destroyed if goldfishes are kept with turtles. On the other hand, another fact is that most of the time goldfishes grow much larger particularly even bigger than turtles. If so happens, then your turtle can be at high risk. Besides if the goldfish is smaller in size then it might get eaten by your painted turtle. Therefore it is better not to keep them together. No, koi fish and painted turtles do not go along. Some people are much eager to keep them together but I recommend not to. Koi fish may grow much larger than your painted turtles do! On the other hand, if you keep small koi fish then you are giving your turtles an expensive yet delicious dinner. Therefore keeping Koi fish and turtles together is indeed a bad choice. Tropical fishes are highly praised for their long tails and fins. Tropical fishes are not recommended as tank mates for painted turtles because, out of curiosity your turtles may injure them. Although zebras and tetras also possess attractive fins and tails I recommend them because they are light on foot. As they are fast and agile there is a greater chance of safety in their case. Therefore you better not go for tropical fish tank mates with your painted turtles in the same aquarium. If you keep relatively small but agile fishes that are good mates for your turtles then it is better to keep a hiding space. Making a hiding space in painted turtle aquarium is always a safety zone. Turtles always hunt for fishes and even the painted turtles do the same. Therefore, if you keep a hiding space, if any bad time arises then your fishes will be risk-free. Making a hiding space in the aquarium or tank creates a healthy and good accommodation environment for your turtles and fishes. It is clear that keeping fishes and painted turtles in the same tank are not recommended. But if you are eager to do so, you need to keep an eye on a few facts. If such considerations are met then it’s absolutely okay. However, you need to be very careful about selecting the type of fish species along with the aquarium environment.